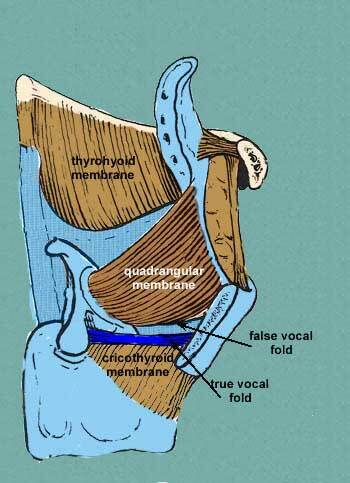 The thyrohyoid membrane (or hyothyroid membrane) is a broad, fibro-elastic sheet of the larynx. It is attached below to the upper border of the thyroid cartilage and to the front of its superior cornu, and above to the upper margin of the posterior surface of the body and greater cornua of the hyoid bone, thus passing behind the posterior surface of the body of the hyoid. It is separated from the hyoid bone by a mucous bursa, which facilitates the upward movement of the larynx during swallowing. Its middle thicker part is termed the median thyrohyoid ligament, its lateral thinner portions are pierced by the superior laryngeal vessels and the internal branch of the superior laryngeal nerve. 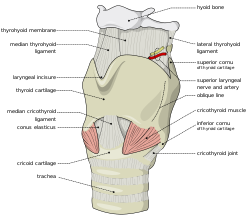 Its anterior surface is in relation with the thyreohyoideus, sternohyoideus, and omohyoideus muscles, and with the body of the hyoid bone. It is pierced by the internal laryngeal nerve and the superior laryngeal artery. Muscles, nerves and arteries of neck. Deep dissection. Anterior view. Atlas image: rsa3p11 at the University of Michigan Health System - "Larynx, anterior view"
Atlas image: rsa3p12 at the University of Michigan Health System - "Larynx, lateral view"